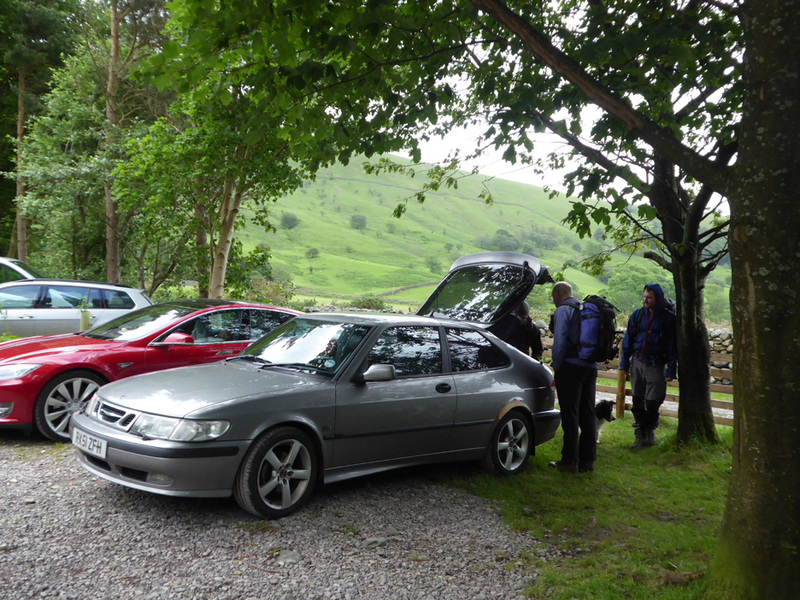 " The Railway Children Three Peaks - Scafell Pike - 2017 "
Location of Start : The Brackenclose NT car park, Wasdale Head, Cumbria, Uk. 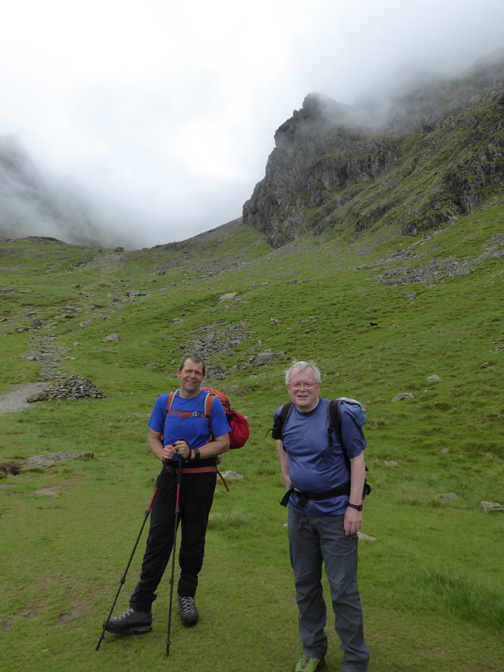 Places visited : Brown Tongue, Hollow Stones, Scafell Pike, Lingmell Coll and back. 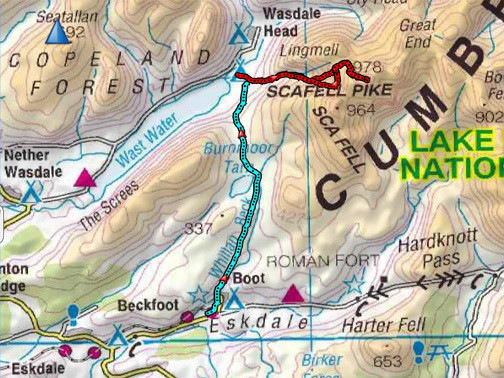 Walk details : 5.8 miles, 2925 ft of ascent, 9 hours including the one big stop. 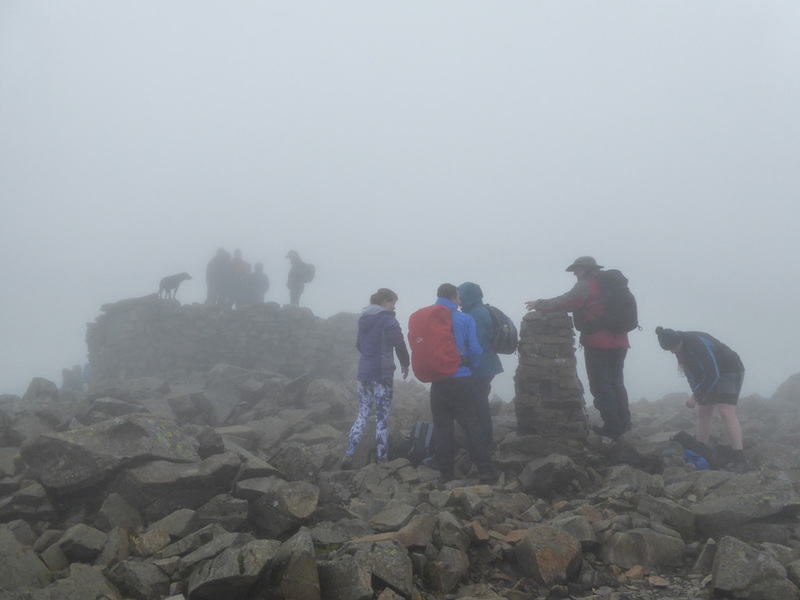 Highest point : Scafell Pike, 3210 ft - 978m. Walked with : Dylan and myself, with seven colleagues and about 160 charity walkers. Weather : Overcast and damp - the forecast said low cloud and wind at altitude. 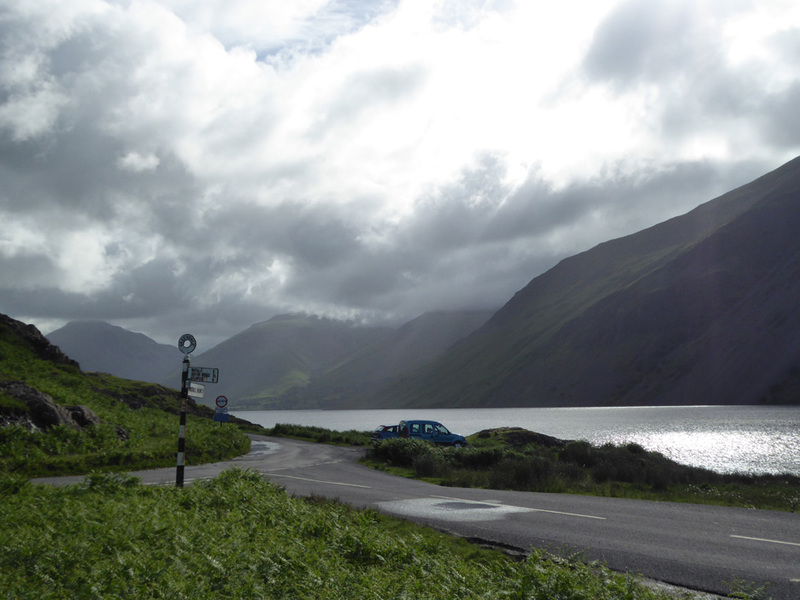 The 42 teams will climb Snowdon, Scafell Pike and Ben Nevis, travelling by train over the long weekend. 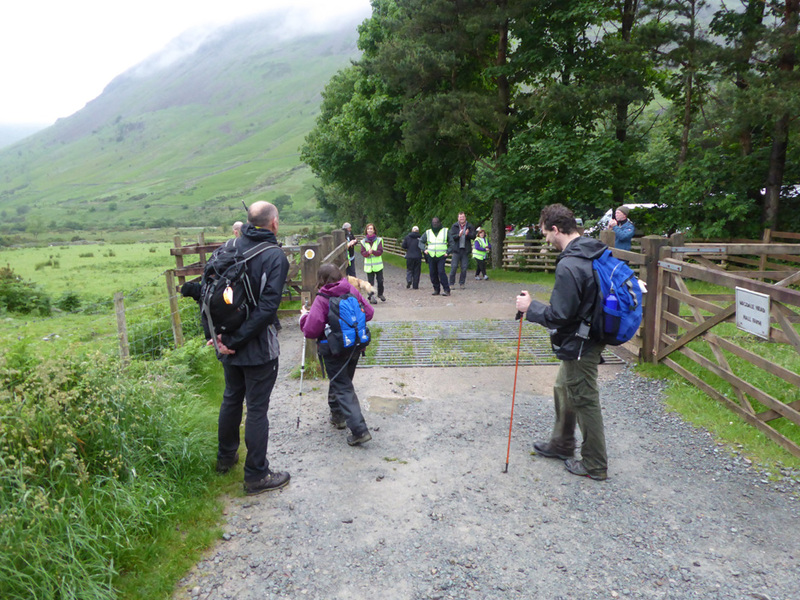 As a member of the safety crew in the Lakes, I will be assisting the walkers on the Cumbrian leg of their adventure. 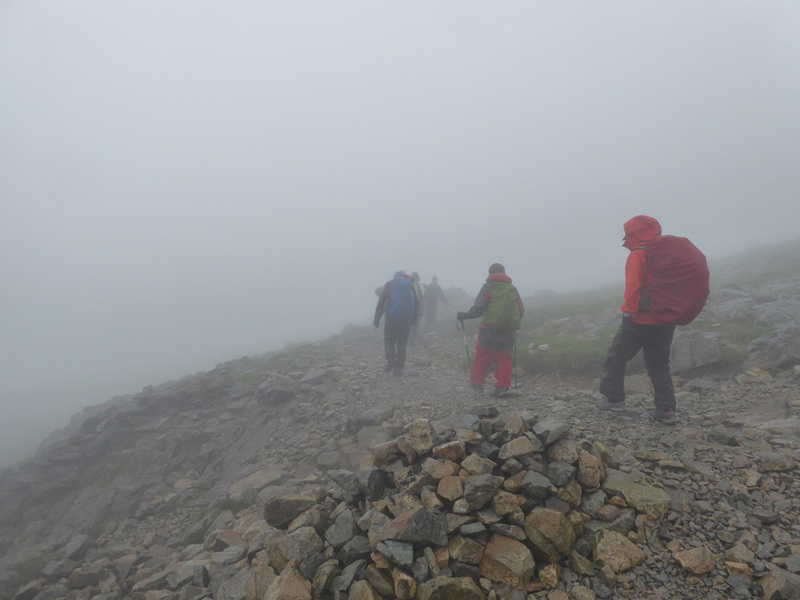 It was a promising day but the forecast for the fells was poor. As I reached Wast Water the weather forecast was confirmed, with cloud down on the Scafells and just touching the top of Great Gable. there is a cold front bringing poor weather to Scotland and the north-western side of the country. Down in the valley it is fine and dry with a gentle but warm breeze. We meet up and collect radios and team sheets. 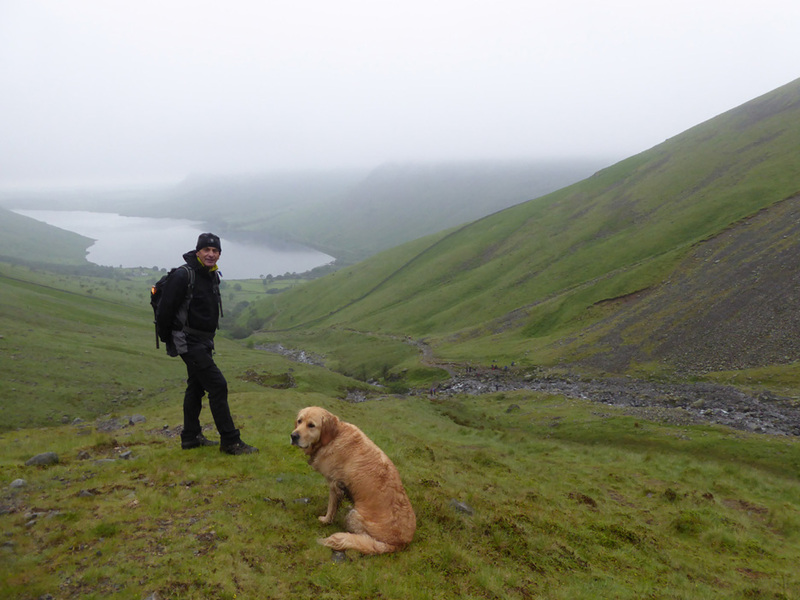 Dylan is joining me on the fells today as I pack the final items into the rucksack and get ready to set off up the fell. He's looking very serious about his task ahead ! 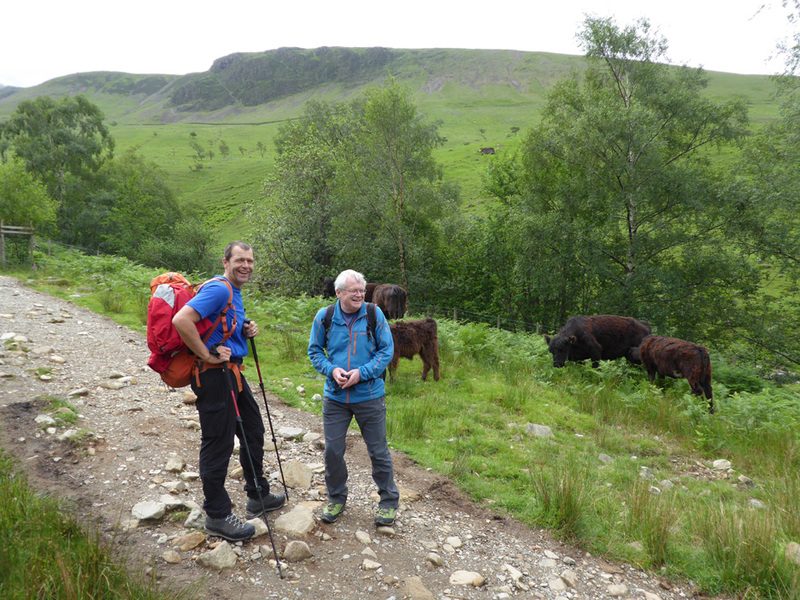 while three of us, Richard, Peter and myself head up the Brown Tongue route towards Scafell Pike. Down here the weather is fine . . . good walking weather if a little humid. 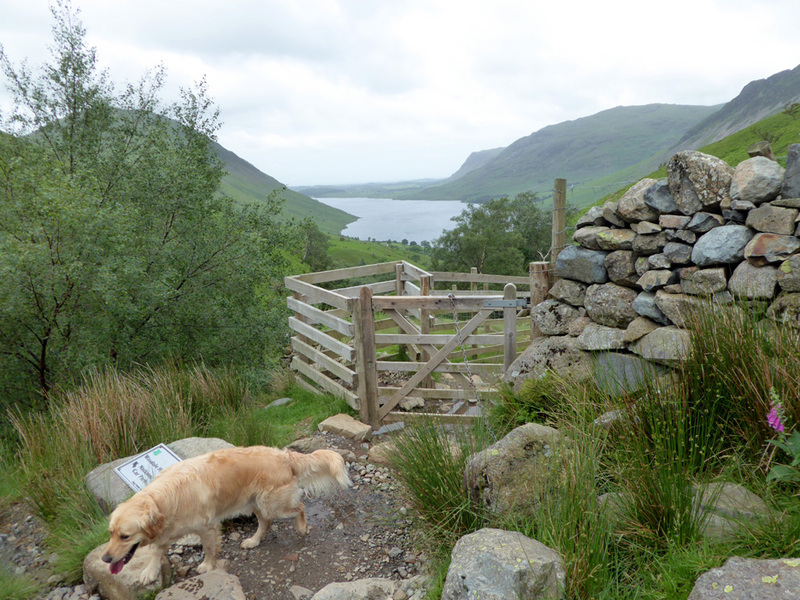 This is the view back down to Wast Water from the gate below the Lingmell Beck crossing. 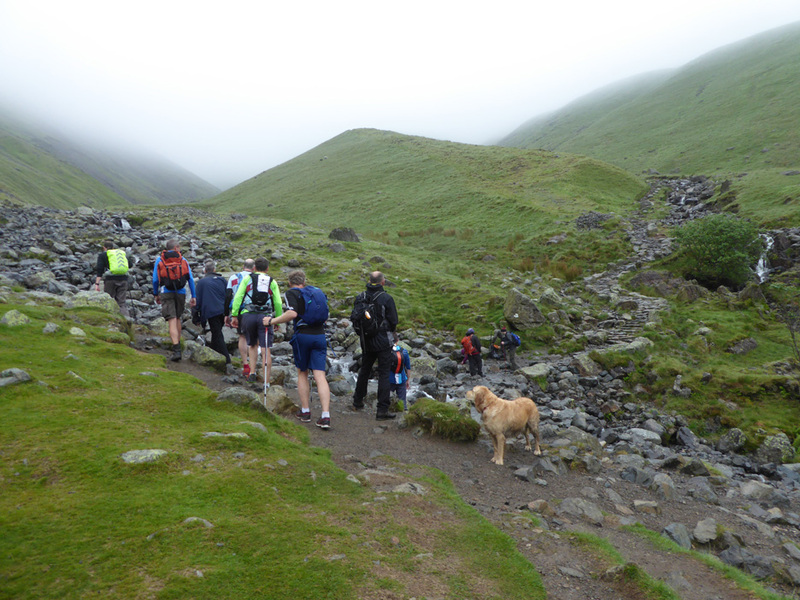 many as part of the National Three Peaks Challenge. 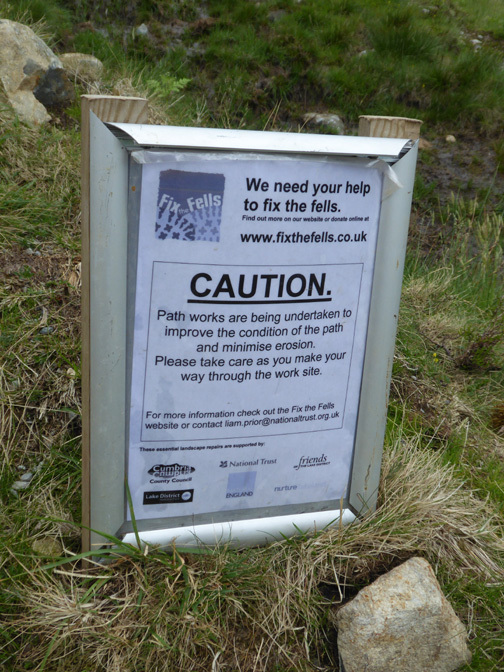 Consequently the Fix the Fells teams has been kept busy maintaining the path and preventing erosion. It's not yet 10am yet we are being passed by many groups of people who have already been to the summit and back. This is the shortest but steepest walking route up the fell and takes 2-3 hours on a good day. 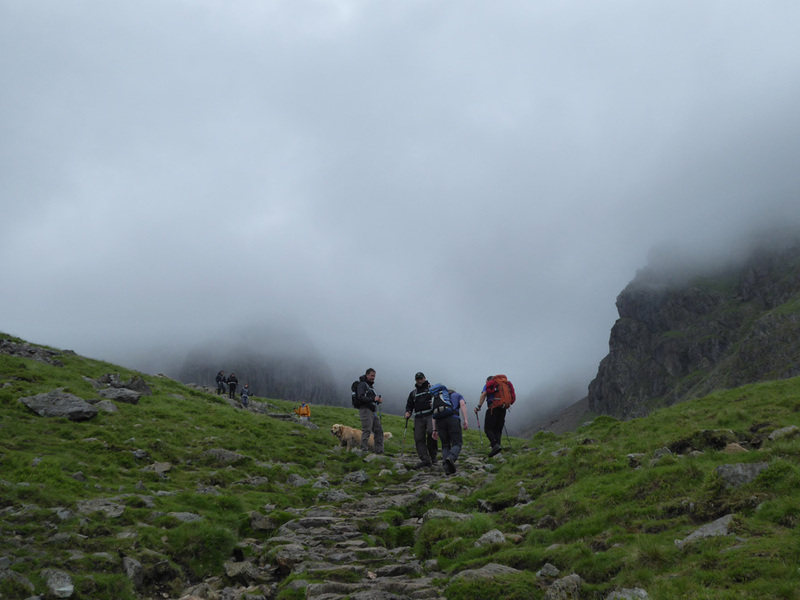 We've reached the top of Brown Tongue and now the clouds are swirling around the Scafell Crags above. Richard will be based near here and Peter lower down . . .
. . . but they've extended their walk so as to enjoy the atmosphere. At the large boulder under Mickledore we part company. 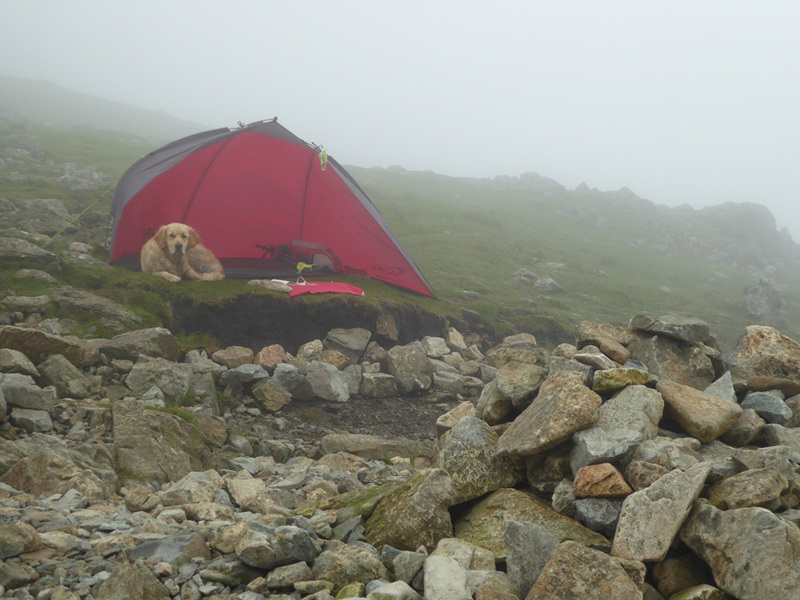 They will head back down to their marshalling points, I traverse across to Lingmell Coll to set up mine. There's one patch of grass at the junction of the Corridor Route and the Lingmell path just big enough for my shelter. As I start to erect it I'm passed by a gentleman called Ray Tee who I met earlier at the start of the climb. There are better places to camp but this will do for our temporary shelter today. but are still down on the lower part of the climb. I have time to make a break for the summit myself ! but it is still acceptable walking weather . . . the top is crowded with other successful summiteers. 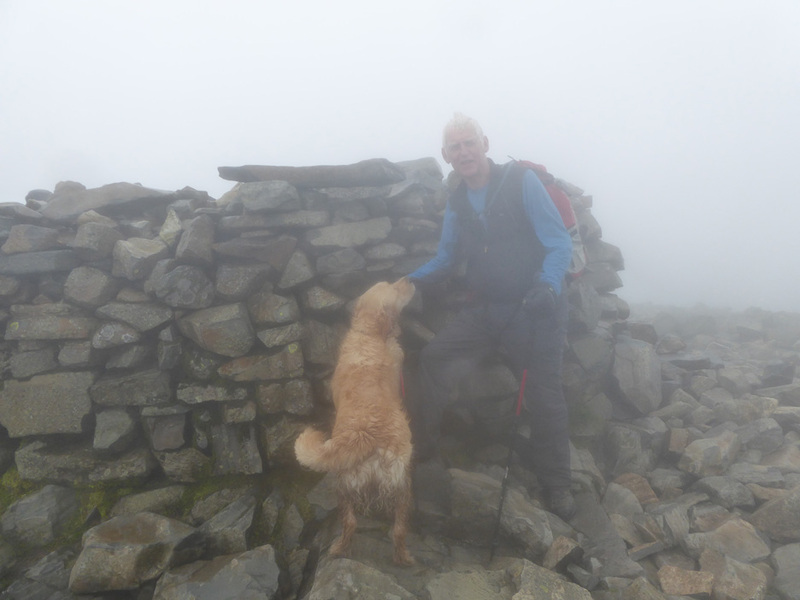 One gentleman kindly records he fact that Dylan and I reached the summit today. Looking at the photo I haven't got a waterproof on so the weather couldn't have been too bad. It's a pity our walkers won't get a view from the top though. 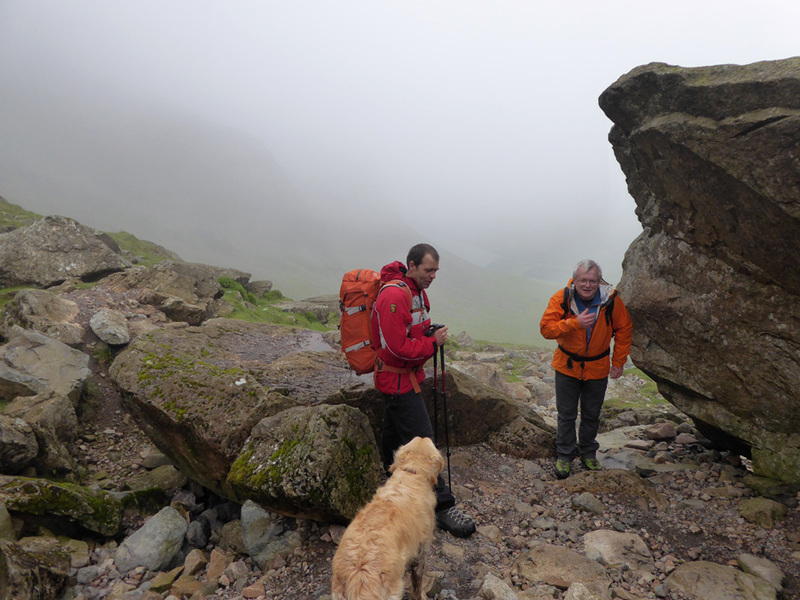 Now the work has to start, checking the teams, so I make a quick descent to Lingmell Coll and return to the the shelter. There are 42 teams of (approximately) four people on the walk today. and the groups are travelling by rail as far as possible. in damp conditions and today rode the Eskdale Railway to Boot. 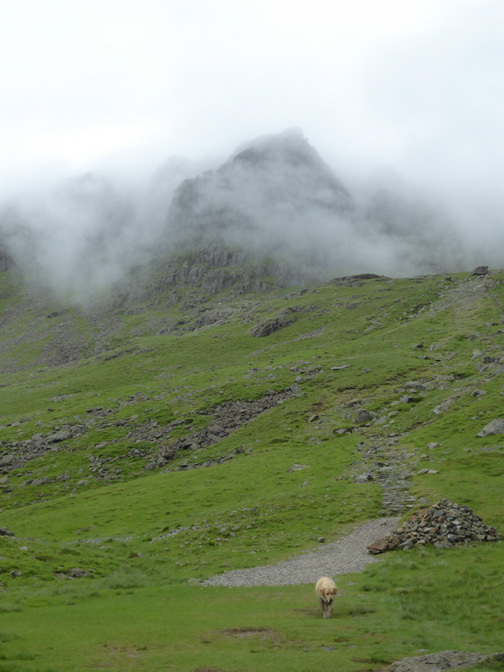 of England's highest mountain, Scafell Pike. This evening they will rejoin their train and head north for the Ben. In the mean time the weather gets a little worse as the cloud and drizzle gets thicker and the wind increases. It's four layers of clothing including my warm Paramo jacket and waterproof Berghaus trousers today. meant it was not really conducive to photography today . . . sorry about that ! 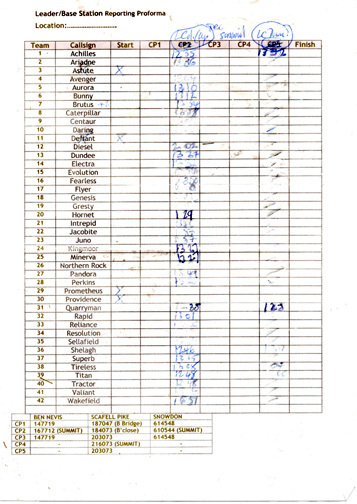 38 of the 42 teams make it up to the summit and back . . . a great result and a big effort on their part. on their own round trip to the summit. 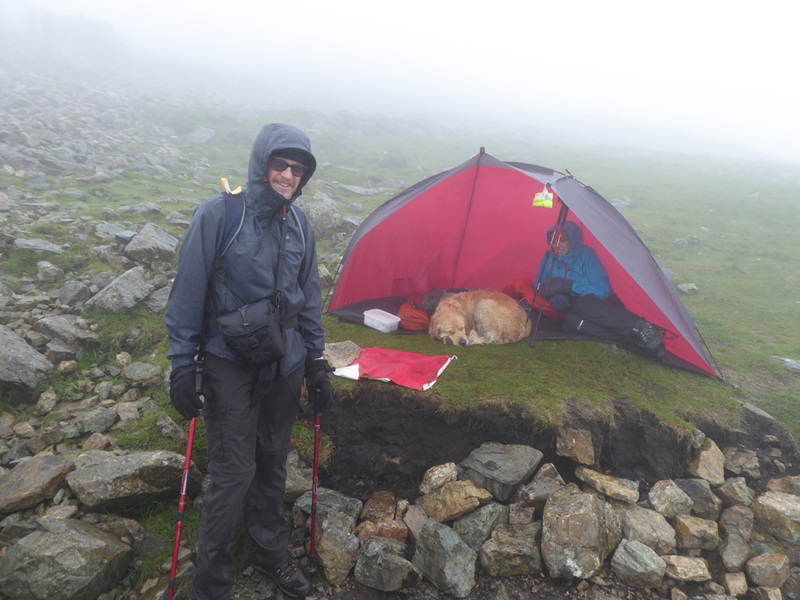 Regards to Jill from More than Mountains who said a soggy hello in passing. 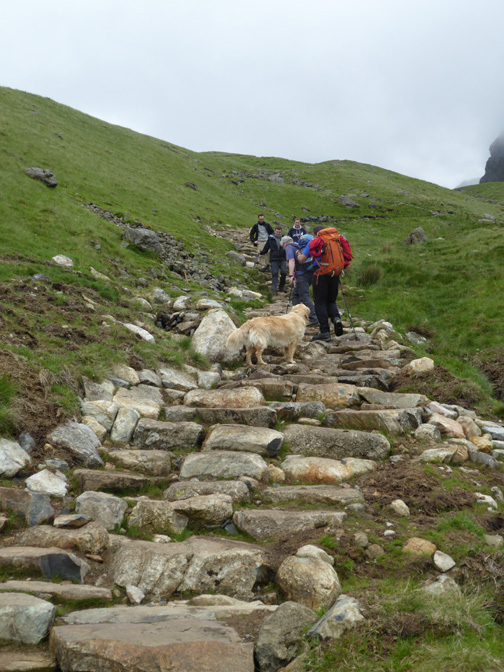 They set off down the Corridor Route as I directed our teams back down the Lingmell path which they had all used on the way up. 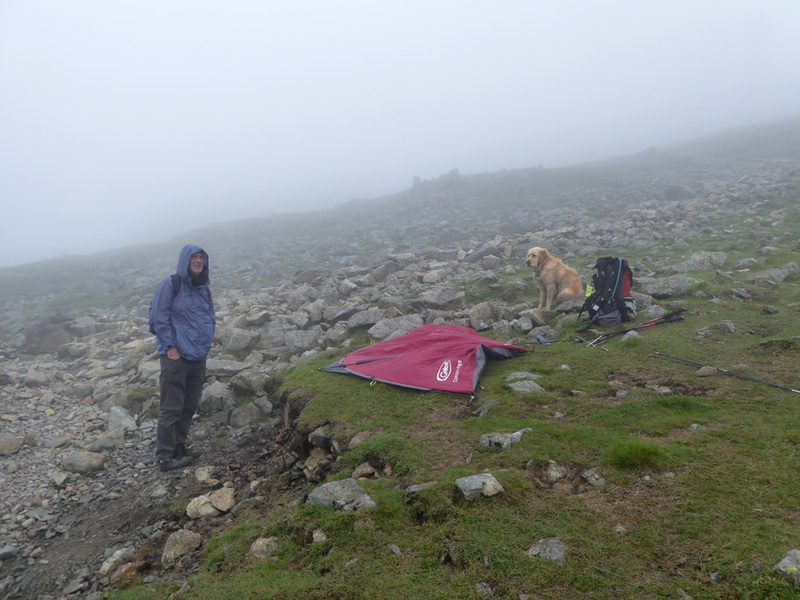 My tent provided shelter for one team member who preferred not to continue to the summit. 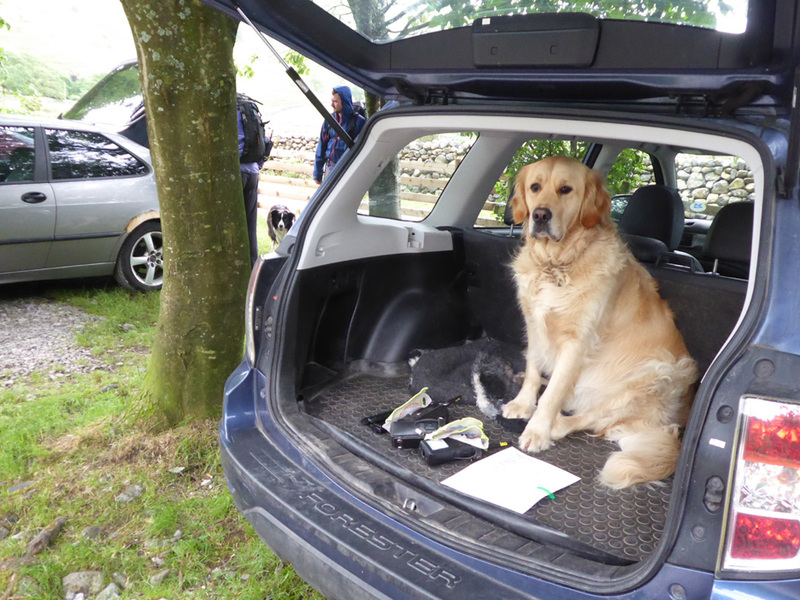 Charlie waited for her team to return in order not to spoil their chance of summit success . . . we shared a barely warm coffee from my flask. The gentleman (sorry I've forgotten your name) was from one of the later teams. 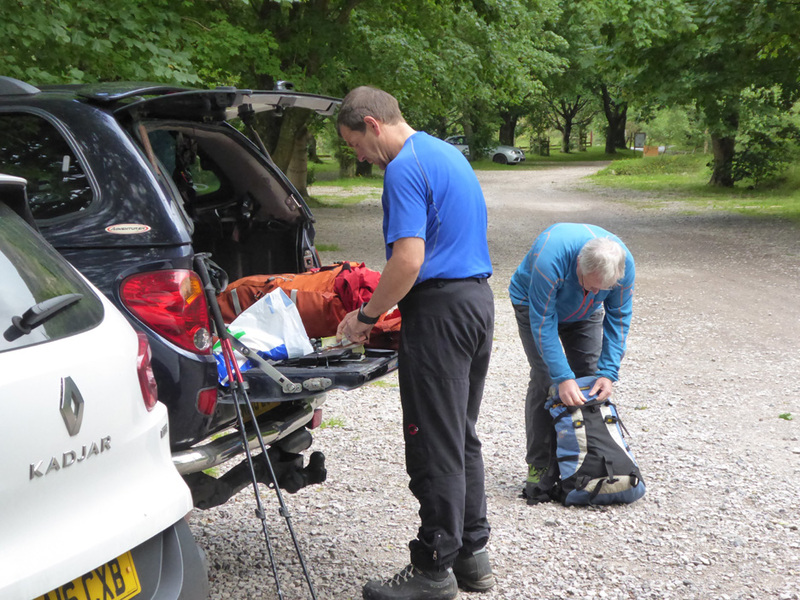 With my fellow marshalls following the final team down from the summit it was time to pack away the shelter. I wonder of Dylan will approve of losing his haven from the weather ? A steady descent saw us gaining a view once again as we reach the Brown Tongue pitched path. 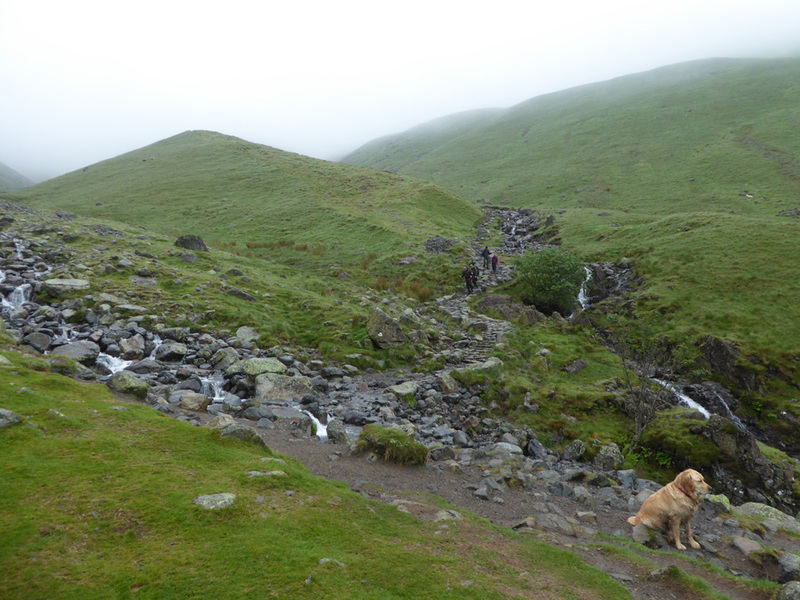 Lingmell Beck crossing ahead and we are well below the cloud base. Our final teams move slowly and steadily down. 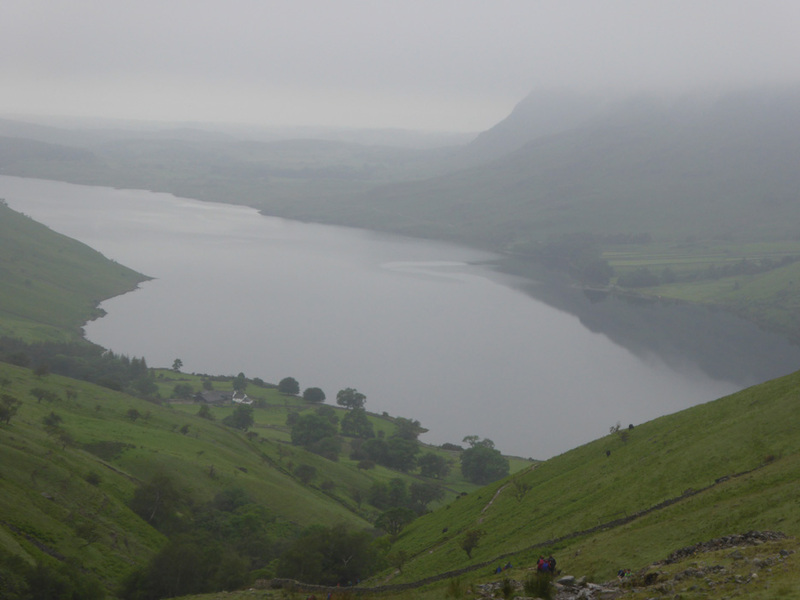 Scafell Pike, especially in these damp conditions, is probably the most difficult of the Three Peaks to climb. 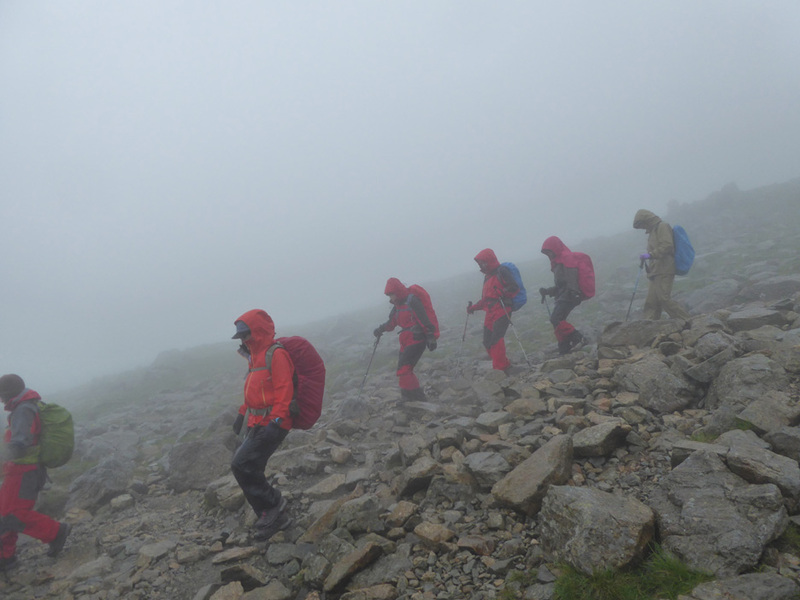 Snowdon is higher but shorter and with less loose rock, Ben Nevis is an easy path up but a long continual ascent. 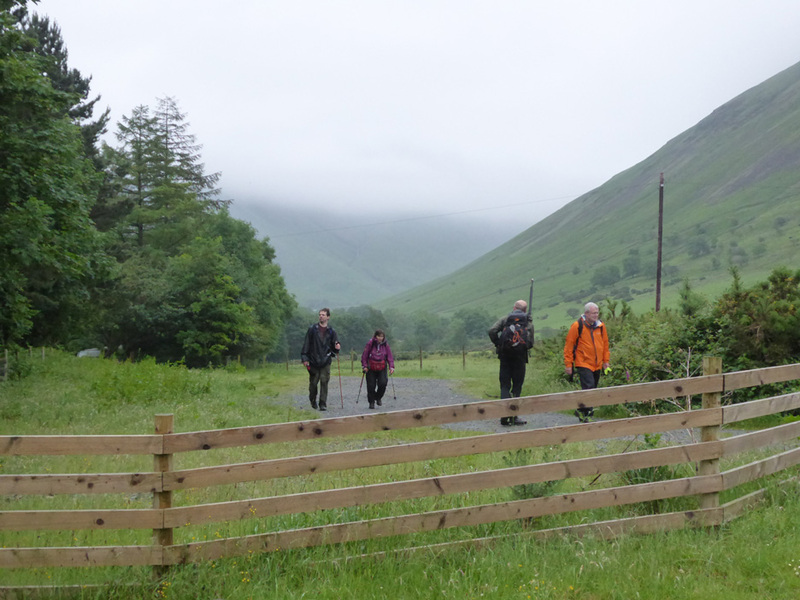 With the initial 4 mile walk over from Boot and the six mile climb the teams have done well today. As we descend even more people are on their way up to the top. The marshalls down here haven't suffered the wet weather but they did have to put up with a few midges that we didn't get. Can't win them all ! 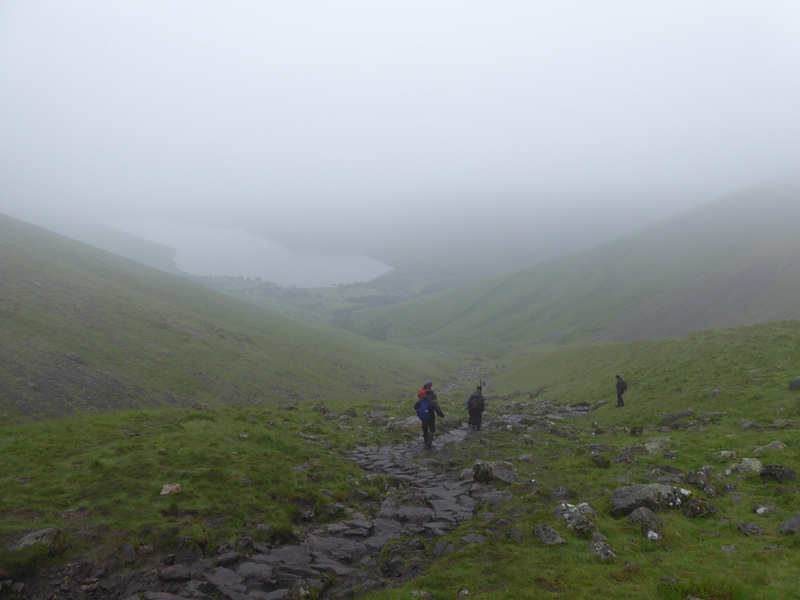 A last look down on Wast Water before we retrace our steps to Brackenclose. Waiting for them down there is a local bus that will take them back to Ravenglass and then their train to Scotland. The last few yards now as we reach the valley. A big welcome from the organising committee . . . and another peak successfully climbed on the way to raising money for the charity. adding to the total of around £2.4 million raised by this event over the many years that it has been held. Technical note: Pictures taken with Ann's Panasonic Lumix TZ60 Camera. This site best viewed with . . . an extra sandwich and energy sweets to keep people (and dogs) warm.